"That was weird. That was really weird," exclaimed one audience member after hearing pianist Susan Chan play "Memories in a Ancient Garden" by Alexina Louie. Chan was standing and had finished reaching into the Steinway to strum its string like a harp. The strumming created an odd atmospheric effect - evoking the sense of someone who had stumbled into a long forgotten garden - and it received a strong reaction. A round of enthusiastic applause followed the comment and seemed to cover over any awkwardness. But I think that it was very cool that this music received such a strong reaction. The audience of about 200 people in Lincoln Hall's auditorium had been following the second half of Chan's program very intently. This program featured new compositions of Asian composers (all living)and the music evoke a lot of Asian influence in the structure of the harmonics. One piece, "Incarnation II" by Somei Satoh, consisted of closely hue tone clusters that were mostly in the lowered register of the piano. The repetitive playing of the tones caused a lot of overtones in the upper register even though no notes were played in that part of the keyboard. A piece by Doming Lam perked up everyones ears with its unusual harmonics, and all of the numbers gave a good shape to this program, which Chan gave as a preview of the performance that she will present in Carnegie Hall later this fall. The first part of the program consisted of works by Bach, Chopin (8 of the 24 preludes), and Busoni's arrangement of Bach's Chaconne in D minor. All of these were played extremely well by Chan - although I think that her interpretation was a little freer with the first three Bach numbers (Prelude in B minor, Sheep May Safely Graze, and Jesu, Joy of Man's Desiring). As the comment to the previous post noted, Jossie Perez will be singing a selection from Carmen at the Oregon Symphony's Waterfront concert tonight. Perez is a rising star in the opera world, especially noted for her performances of the naughty girl who works in a cigarette factory in Spain and runs around with gypsies who are involved in illegal activities near the border. That's part of the story of Carmen, which the Portland Opera will be performing later in the month. I'm not crazy about the photo of Perez that Portland Opera is using to promote Carmen, but Perez does have some delicious pics of herself on her website: jossieperez.com. In any case, I think that this marks the first time in many, many years that someone is appearing in a Portland Opera production and with the Oregon Symphony. I'd like to see more of this kind of thing. It's cross promotion and well worth the effort. And I'd like to see Carlos direct a Portland Opera production some day, too. Portland Opera's very talented chorus master Robert Ainsley will give a free lecture about Bizet's Carmen during lunch hour on September 7th in the U. S. Bank Room at the Central Library (801 SW 10th Ave.). It's a free presentation that will include background information about the opera. You'll also be able to to hear some of the musical highlights from the Portland Opera Studio Artists. Although you may think that you know everything about Carmen, Ainsley will probably give some new tidbits to ponder. These presentations are fun, and they are free! Oregon Symphony's artistic director is a busy fellow during the summer. He has a full schedule at the Grant Park Music Festival in Chicago and does some guest conducting at the Grand Teton Music Festival and with the Baltimore Symphony. I didn't find an online review of his concert with the Grand Teton Festival Orchestra, but I did find three reiviews (all positive) of Kalmar's conducting in Chicago and Baltimore. Sidenote: Smith is the president of the Music Critic Association of North America (of which I am also a member). Kalmar is back in town next week to lead the Oregon Symphony's Waterfront Festival concert on August 30th. If you want to hear something new and unusual, be sure to attend the upcoming concert by the Free Marz String Trio. Artistic Director Bob Priest has put together a program that will bring the music of the spheres to your ears. Called "Constellations: Recent Music from the Outer Limits . . .," this concert features brand new works by Priest, Darol Anger (who used to play with the Turtle Island String Quartet, Marylhurst Professor John Paul, Thomas Daniel Schlee (an Austrian composer), and works you've probably never heard by avant-garde, Greek composer, Iannis Xenakis, and Benjamin Britten. Members of the Marz String Trio are violinist Ines Voglar, violist Joel Belgique, and cellist Adam Esbensen. All three are also members of the Oregon Symphony. The concert is free (reputedly underwritten by aliens) and will be presented on Friday, September 28 at 8 pm at the Community Music Center (3350 SE Francis St., Portland). A reception follows the concert. BTW: last year's concert by the Free Marz Trio was standing room only. So, get there early if you want a seat. I'll follow up this announcement with an interview with Priest closer to the date of the concert. Pianist Susan Chan, a relative newcomer on the Portland music scene, will be playing an unusual recital of music from East and West in Carnegie Hall on September 16th. As a preview of this concert, Chan will give the same program on Thursday, August 30th at 7 pm. Chan is a member of the music faculty at Portland State University and is a very fine artist who deserves serious consideration by Portland's piano cognoscenti. She has played in Carnegie Hall before - in 2004. Tickets for the preview concert on August 30th are $20 for adults, $16 for PSUAA members, and $12 for seniors and students. *Rufus Wainwright - "Pretty Things"
*Franz Schubert - "Das Grab"
*William Byrd - "Wounded I am" and "Delight is Dead"
*Joanna Newsom - "En Gallop"
The concert begins at 9 pm, so you have plenty of time to finish your evening meal. Tickets at the door are $10. I just published an article about A-WOL Dance Collective's "Art in the Dark" show on livepdx.com. A-WOL specializes in aerial dance and has done very well to build an audience. I think that it would be terrific to see a collaboration between this dance company and a classical music group. Of course, Third Angle and Fear No Music are two groups that might be able to present such a show at a venue like the Wonder Ballroom or perhaps Kaul Auditorium. Another collaboration that might be fun to see someday is one between the bicycling community and classical music. Perhaps a classical group could offer a program that featured music about motion/wheels/gears etc. Maybe tickets at a discount could be sold to people who agreed to ride their bikes to the concert. I guess it would have to be an afternoon concert and some shelter/security would be necessary to make sure that the bicycles remained dry and returned to the proper owner. In any case, the main thing would be to reach out to the bicycling culture that is gaining momentum. Seattle Opera opened its 44th season on Saturday evening at McCaw Hall with a superb production of Der Fliegende Hollaender (The Flying Dutchman). Anchoring an exceptional cast was Greer Grimsley in the title role and Jane Eaglen as the woman who saves him from the curse of continuously sailing the high seas. Clear and straightforward stage directions by Stephen Wadsworth and a wonderfully evocative stage design by Thomas Lynch (reviving Seattle Opera's 1989 production) were complimented by the strong playing of the orchestra under the baton of Asher Fisch and terrific singing by the chorus. Grimsley's robust bass-baritone amply rang true through the evening. He could easily throw down the throttle and match the huge and beautiful sound that Eaglen can produce. At one point in the second act, Grimsley was able to transition from a full sound to a hollowed out sound that added to the haunting anguish of his character. Eaglen sounded top notch throughout. She took the last verse of Senta's ballad in a very slow tempo that would've just left most other singers gasping for breath. Over all, it added greatly to the emotion of the story. Exceptional singing by Jay Hunter Morris as the frustrated lover Erik and Luretta Bybee as the disciplinarian Mary helped to distinguish their characters and propel the opera forward. Daniel Sumegi in the role of ship captain Daland did a fine job, although I'd prefer that he spit out his consonants more often. Jason Collins debut as the Steersman was a bit unsteady. It seemed that he had trouble supporting his voice in the higher register. But perhaps that was his opening night jitters. The first act opened with a Norwegian trawler stalled in fog-enshrouded waters. As the steersman falls asleep, the Dutchman's galleon, larger and imposing, dramatically draws up alongside. The second act took place in the large workroom of a house in a coastal village. A large painting of the Dutchman dominated one wall, and the women worked on sewing projects from one end of the room to the other. The scene had an older refrigerator and an odd assortment of mismatched chairs and the women passed around a laptop as they worked and sang. The third act featured a high sea wall where the sailors and the womenfolk lounged around. The ships were docked behind the wall, making an effective backdrop for the last part of the opera. Here Wadsworth's directions moved a lot of people around, but it wasn't too much, and they all effectively helped to communicate the story (as when, for example, the sailors listened for a response from ghostly sailors of the Dutchman's ship). I thought that the Dutchman's crew could've sang a little louder in order to overwhelm and frighten Daland's sailors in the last act. But both the mens and womens choruses, trained by Beth Kirchhoff, sang outstandingly. Costumes by Dunya Ramicova were modern except when the Dutchman removed his overcoat to reveal a ship captain's black and gold outfit from a much earlier era. One of the fun things to notice was the family aspect in this production, because not only were the husband/wife team of Greer Grimsely and Luretta Bybee involved, but also their daughter Emma was one of the supernumeraries. She was the sullen teenager who sympathized with Senta, staring at the Dutchman's picture. The interaction between mother and daughter was fun to watch especially when Mary snatched a cigarette from the teenager and then smoked it herself. In comparison with Portland Opera's production of the Dutchman earlier this year, I think that Seattle won out. Portland did have a provocative set design, but some of Christopher Alden's stage directions were very unclear and didn't help us to understand the story. Although Richard Paul Fink and Elizabeth Byrne in Portland did an excellent job, I would put the duo of Grimsely and Eaglen against any other. If they keep singing like they did in this production, their artistry will become the stuff of legends. I'm thinking that other organization like the Oregon Symphony and Portland Opera will be taking advantage of these venues soon, too. In the meantime, kudos to Powell and CR. Greer Grimsley, the terrific bass-baritone who often stars in productions with the Seattle Opera, will be singing the title role in Wagner’s Flying Dutchman. I have heard Grimsley in several Seattle productions: Lohengrin, The Girl of the Golden West, Parsifal, and the Ring Cycle, and in Portland Opera’s Tosca, and have been impressed every time. I talked with him over the phone last week about the Dutchman and singing these big, heavyweight pieces. How are rehearsals of the Dutchman going? Grimsley: The rehearsals are going really well. I haven’t done Dutchman with Stephen Wadsworth before, but I find it very interesting, and we are having a great time. I’ve done the role of the Dutchman many times. It was one of the first Wagner works that I’ve stepped into. How do you learn a role like The Dutchman? Grimsley: This role fits me like a glove. I don’t have to work around places that cause me difficulty in learning it. In general, you want to allow yourself a least a month to learn a new role, study it and get it into your muscle memory. The first two times I got to perform Wagner, an angel must have been looking out for me because a friend of mine was running an opera company in Germany and invited me to sing parts of Lohengrin and Dutchman, so that was a great way for me to get into it instead going directly to a staged operatic version. These were concert versions. So, that helped to cement both roles. Later I did my first staged version with Utah Opera. When you are learning a new role, you are immersed in it. You have to go at it like a sprinter does. You have to choose your sections of music and then go after it for an hour or two to concentrate on it. Then you get some time away and translate the text, research it, work on the difficult passages that are rhythmically challenging. Once you start that, your mind is always there. You are thinking about it for eight hours a day. Vocal coaches help you to shape the music. So do you sing around the house in full volume? Your wife might not like that. Grimsley: Fortunately, my wife is a professional singer. Her name is Luretta Bybee, and she was one of the Valkyries in Seattle's last Ring Cycle, and she'll be singing the role of Mary in this production of the Dutchman. Handling Wagner depends a lot on whether you have the natural gifts when you come into it. A lot of it has to do with what you were born with. A big component is breath control which is taxed to the maximum. But on singing loudly -- once you get to a certain point in study, it’s more about relaxing into your body and allowing natural processes to work. Is there an aspect of the Dutchman’s character that you try to stress? Grimsley: Of course the brooding aspect of his character is stressed, but let's not forget about the human aspect of what got him into this predicament. Wadsworth and I agree about that and we are working on it. The Dutchman made the mistake of raising his fist to the heavens and saying that he will round the cape and the Devil damns him to this curse. It’s the story of a sea captain who wants to do the best for his crew and his ship and to get back to port no matter what. There is a human aspect to this. If one of us were a sea captain, we would want to get back to port, to get back to our families, also. You hear that in the first aria that he sings. It’s not just railing, it’s also his vulnerability. You want the audience to care about him. He had a responsibility for the crew who also want to get back to port to see their families. Grimsley: It was a series of accidents. I was in drama club, and debate, and band in high school. In my senior year, I wanted to study archeology and was applying to colleges for that. A friend of mine was a character singer at the Met. He taught at my high school and encouraged me to think about music. So I did an audition and was accepted into the the Loyola School of Music in New Orleans. Archeology is a great hobby of mine, and it helps me to research opera. As a senior I thought that I would train classically and then go into musical theater. Tell us about your work with Jane Eaglen. Grimsley: Jane and I have known each other for a long time – 16 or 17 years. We were singing at the same time – not together – at Scottish Opera. She is a force of nature. What do you have coming up for future engagements? Grimsley: I will sing in New Orleans, Méphistophélès in Faust, and later the Berlioz Requiem in Buenos Aires. Then the Ring Cycle at the Deutsche Oper in Berlin. I’m coming back to Portland Opera to do Aida, then in Seattle for Tosca. Do you have children who are interested following in your footsteps? Grimsley: My daughter is doing really well with singing in her high school choir. She has a great voice. I’m encouraging her but not pushing her. My parents didn’t push me in any direction, and I've always appreciated that. 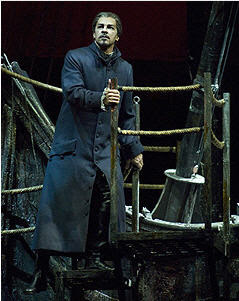 Seattle Opera's The Flying Dutchman runs August 4, 8, 11, 14, 17, 19, 22, and 25 in German with captions in English at McCaw Hall. For tickets, click here.